Sources say Amare Stoudemire will know as early as Tuesday if he needs season ending back surgery. Stat was diagnosed with a bulging disc after the Knicks win against the Pistons on Saturday. In the last week Amare's hops were back and it really looked like he was turning the corner. This would be a big setback to the up and down Knicks, who are 7-1 under interim head coach Mike Woodson. 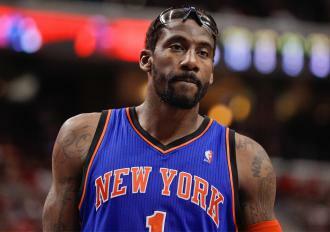 Even if it's not season ending, the injury will most likely have Amare sidelined till the playoffs. Knicks are 2.5 games ahead of the Milwaukee Bucks for the 8th playoff spot in the Eastern Conference. New York is 6-1 without Stoudemire in the lineup. Carmelo Anthony scored 28 points Monday against the Bucks in a very important game for both teams. Melo tweaked his groin in the third quarter, he is officially day to day. Knicks will need Jeremy Lin, who was out Monday with a sore knee to get back to his "Linsanity" role and be more of a scorer like he was in his amazing run. For a 29 year old and over 60+ million owed to Amare, this isn't looking good for NY.